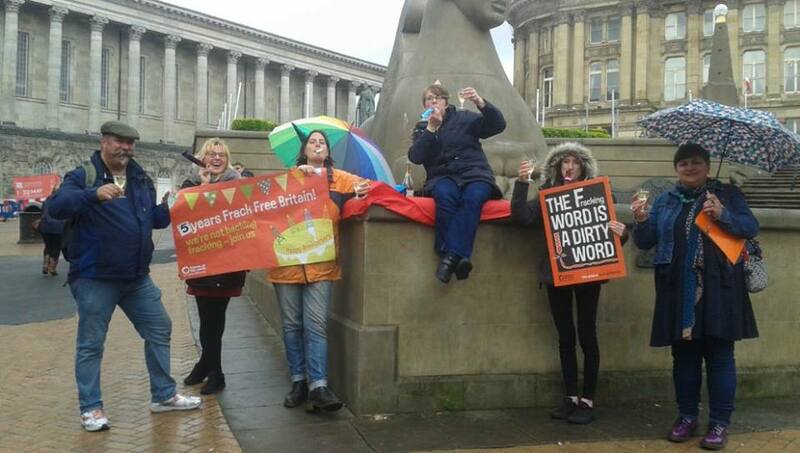 Last Saturday a group of volunteers from Birmingham Friends of the Earth, DivestWMPF and Greenpeace Birmingham took our 5 years frack free celebration to Victoria Square. Despite the rain, people stopped and joined in our celebrations by signing the petition and many also had their photo taken. Our Twitter page was kept busy with our celebration day photos. 5 Years Frack Free is a massive achievement for the anti-fracking movement and it provided an excellent opportunity to send a message to the government that we won’t stop campaigning until fracking is gone for good! On Monday North Yorkshire County Council approved Third Energy’s application to frack the village of Kirby Misperton. Celebrations on Saturday throughout the UK showed that there is tremendous support for the UK to remain frack free. Despite the decision on Monday we will continue to fight for a frack free future!